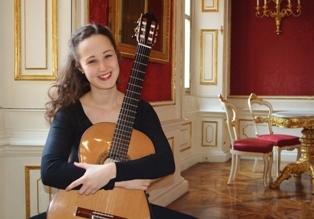 Antonia Haslinger (Salzburg) started playing the guitar at the age of seven. When she was twelve years old she entered the class of Prof. María Isabel Siewers de Pazur at the University Mozarteum Salzburg and in 2015 she became a student of Prof. Eliot Fisk with whom she is studying at the moment. During the last years she attended master classes with Alvaro Pierri, Roland Dyens, Dusan Bogdanovic, Tilman Hoppstock, Štěpán Rak, Thomas Offermann, Gabriel Bianco, Raffael Aguirre, Susana Prieto, Jens Wagner, Petr Saidl, Marco Tamayo, Kostas Tosidis, Simone Fontanelli, Ana Vidovic, Dale Kavanagh, Anders Miolin, Cecilio Perera, Marek Zieliński, Nutavut Ratanakarn, Senio Diaz, Guy Traviss, Sabine Thielmann, Dieter Kreidler, Augustin Wiedemann. She is currently playing on a guitar made by the spanish luthier Vicente Carrillo. You can listen to Antonia on her YouTube channel. Check out Antonia’s website here and Facebook page here! If you are interested in working with Anatonia, please get in touch with the EMCY Office.